I always start any public meeting by counting how many people were in the room - today was 60. There may of even been the odd library or public type, but I can't be sure. I'm learning all the time and today was finding out over a dozen interviews with councillors were requested (before or after the meeting). But, and correct me if I'm wrong, but no media type was in the room. Oddly enough, two pieces of news appeared online today about an hour or so before the cabinet meeting. Both were from agenda items to be discussed, They were: Warwickshire excluded pupils teaching unit 'may close (BBC, 14 July 12:31) and £15million expansion plans for Warwickshire primary schools to meet rising pupil numbers (Coventry Telegrapgh, 14 July). I have my theories: Pick n Mix and Hit and Fade. Agenda Item 2: Libraries started at 1.52pm (and lasted for 22 mins). It was confirmed by Colin Hayfield that Councillors will have the opportunity to be aware of individual library cases. I take that to mean if a Community Group has submitted a business case or expression of interest, then it can be inspected. 12. Requests that the possibilities for providing small amounts of one off revenue and/or capital support for Community Library bids are investigated and reported back to the October meeting of Cabinet. 13. Requests that the report to Cabinet in October 2011 includes the consequences of increasing the book/stock fund and removing the charges for use of the people's network computers in libraries. 14. Requests that a joint business plan and report be explored with Stratford on Avon District Council library and property services, around a joint facility in Elizabeth House or alternative options. 15. Notes the request for an interim report to the Communities Overview and Scrutiny Committee. Some Councillors commented on issues of: incorrect information, rural isolation (of Alcester, Coleshill and Shipston). In summary, there was some disquiet expressed at the speed of all this happening, as if in a rush - would wrong decisions be taken? Even if these were small differences (in data analysis), they could make great changes (to the overall situation). The issue of Warks Direct (within a library) reared it's head again, with Councillors once again pointing out a reduction in hours would equal a loss of service. The Chair, Councillor Alan Farnell, pointed out that ALL 34 libraries were being discussed and NOT just the 16 (earmarked for closure). As a simple statement of fact, this does have a larger bearing as the discussion can centre around the 16 (and forget the other 18). All these changes are starting and aimed at April 2012...as long as we make the savings reiterated Colin Hayfield. 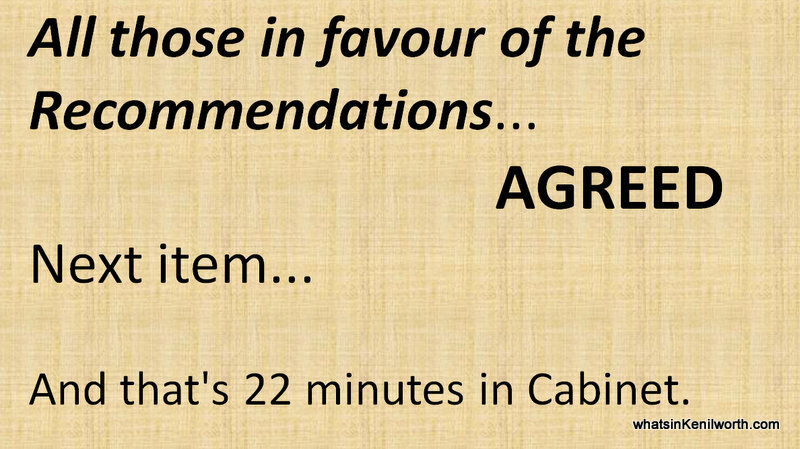 All those in favour of the Recommendations...AGREED. Next item... And that's 22 minutes in Cabinet.